Before they were Avengers, members of Magneto’s evil mutant Brotherhood, or the subjects of the High Evolutionary’s twisted experiments, Pietro and Wanda Maximoff were family — twins — and the only people in the world looking out for one another. The currently running Marvel Comic series Quicksilver: No Surrender is adding depth to their characters in the best way. 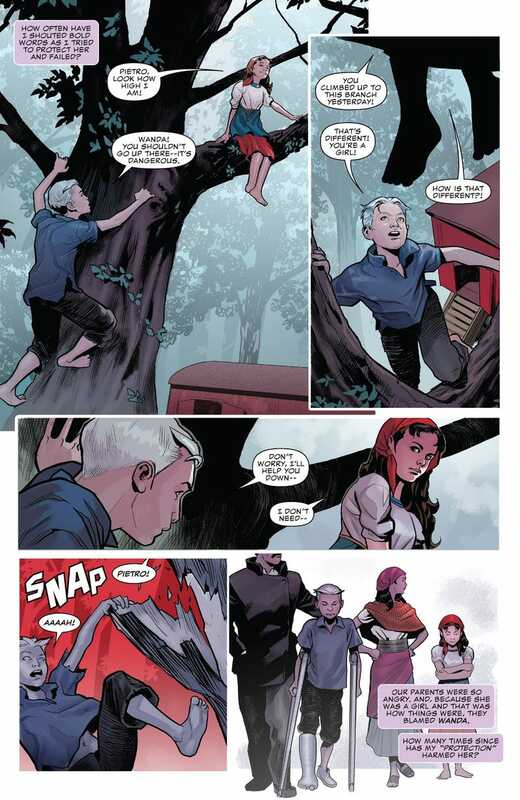 The Maximoffs have lived many different lives in the almost 55 years since they first appeared in X-Men #4. Gradually, they evolved from campy villains befitting the ‘60s into complicated, nuanced antiheroes whose personal lives have transformed the landscape of Marvel’s comics in different ways. Wanda, most often depicted as having a tenuous grasp on reality and her abilities to manipulate it with chaos magic, has been the driving force behind some of the most monumental events in the universe. The sheer magnitude of Wanda’s power alone is what often makes her the target of villains, like Magneto, seeking to use her power for their own motives. While Pietro’s abilities are nothing like his sister’s, their connection has always made him a power player in his own right, because he’s one of the few people in the world who understands and can emotionally connect with Wanda, something rooted deeply in their childhoods. Because Quicksilver and the Scarlet Witch only tend to have meaningful interactions during major comic book events, it’s rare that we actually get a chance to see them spending time together as siblings away from the theatrics of their superhero lives. But their bond has (refreshingly) been a major component of Marvel’s Quicksilver: No Surrender series from writer Saladin Ahmed and illustrators Eric Nguyen and Rico Renzi. 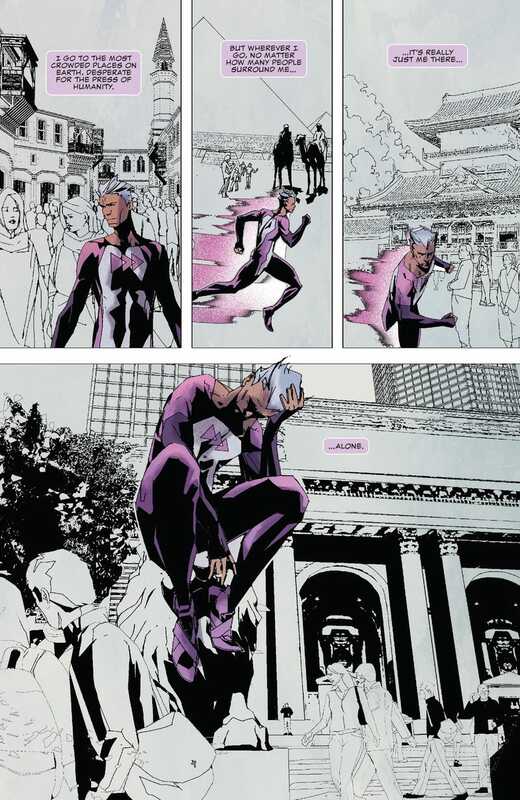 As tends to be the case with the silver-haired speedster, No Surrender finds Pietro alone, frustrated, and in trouble. Unlike in past rough spots where Pietro’s troubles tie back to his criminal past and continued flirtations with villainy, the enemies he finds himself faced with in No Surrender are demons of his own making. Trapped in a world seemingly out of space and time where everything and everyone is frozen, Pietro’s been racing around the globe in search of a way out — a search that’s been repeatedly interrupted by strange apparitions resembling himself. When the false Quicksilvers aren’t attacking Pietro directly, they go after those who mean something to him, forcing Pietro to focus on keeping them safe, all while knowing that he simply can’t keep running forever. In his solitude, Pietro’s had time to reflect back on the events in his life leading up to the present, and No Surrender really digs into the loneliness that exists at the core of his character. For Pietro, it isn’t just that he’s stuck in a world full of frozen people — being super fast makes it that, in a way, that particular kind of isolation almost feels familiar for him. Rather, No Surrender zeroes in on that important part of Pietro’s (and by extension, Wanda’s) identity by using Pietro’s literal race around the world as kind of metaphor for his being a person without a home. Quicksilver realizing that he’s trapped by himself. Though their origins seldom feature prominently in stories about them, the Maximoff twins were born to Romani people living near Wundagore mountain before the High Evolutionary temporarily whisked them away as infants. Perhaps even more than their vigilante careers, it’s the time they spent together as children that taught them the importance of relying on one another for protection, because being Roma meant being born into a life of persecution. When the apparitions set their sights on a frozen Wanda, Pietro races to save her, and in a series of flashbacks we see that Pietro’s lasting need to protect his sister is also the source of a deep-seated guilt and frustration. For all of Pietro’s lifelong attempts at keeping Wanda safe from harm, it’s undeniable that he’s just as often caused her pain. Almost every time Pietro’s attempted to save her, he’s ended up hurting Wanda in the process before she ultimately makes clear that she’s perfectly fine taking the world on alone. Understandably, this reality hurts Pietro, because, to him, it’s proof that she doesn’t necessarily “need” him in the same way that he needs her — she doesn’t wholly define herself by her relationship with her brother. Pietro recalling his childhood with Wanda. For Pietro, saving Wanda here is a solemn attempt to make right all of the wrongs he’s caused her over the course of their countless fallings out and reunions, but it’s also an important learning experience for him. Frozen though she may be, Wanda’s still one of the most formidable witches of her era and, in fits and starts, she breaks through whatever barrier that’s separating Pietro from the rest of the world to remind him of something worth bearing in mind. As lonely and forsaken as Pietro might feel, especially when faced with another instance of his putting Wanda in danger, their relationship is a two-way street. Wanda may drift away from Pietro, but she’s every bit as invested in protecting him as he is her. They’re one another’s people, and nothing short of one of Wanda’s more powerful hexes can change that.